I should have known that this day would arrive. 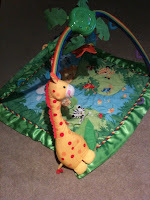 I just didn’t realize that it would spark over an activity mat that I don’t recall Fussypants even being that attached to when he was a baby. I was informed today that He. Can’t. Share. He was adamant that He. Just. Can’t. Squeak is one day shy of a month old and is now more awake and alert, so I figured I’d give her some activity mat time to stimulate her but the moment I laid her on the mat, a “someone is touching my stuff” notification signal was activated in Fussypant’s head and he came a runnin’. At first he just circled but as he started getting closer and closer I realized he was going to “accidentally” step on her. I got there right as he was about to put his foot down on his sister’s foot. When I called him out on it, he dropped to the ground, looked up with forced tears and told me he hurt himself and needed an ice (his school uses the baby teethers for booboos so we use them too), then said he didn’t need an ice, he needed a Popsicle. Yes, a Popsicle would make it all better. When I inquired why he had thrown himself to the ground, he ‘fessed up that he didn’t want Squeak on HIS zoo. I explained that he needed to share and that was when he announced that He. Just. Can’t. I’m not purchasing another activity mat, so I guess sharing is something we start working on now, with maximum supervision. Oh boy… something tells me it might get a lot worse before it gets better. Wish I had some sage words of advice. Good luck? !